For those who had high hopes for The Real News Network, the TRNN love fest with social capitalists like Naomi Klein and other con artists on Wall Street’s payroll — laundered by foundations like Ford, Rockefeller and NoVo — comes as a disappointment. So it should come as no surprise that TRNN start-up money ($350,000) came from Ford and MacArthur foundations. 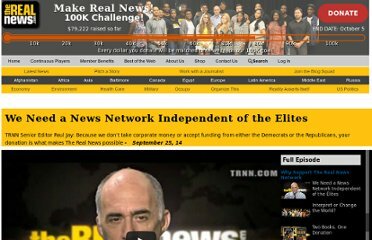 Two thirds of TRNN ongoing operating revenue comes from the rich. After doting on Ms. Klein’s magical social revolution (funded by the Rockefeller Brothers and Warren Buffett), TRNN is now promoting Klein, et al’s “new economy,” that aims to place all control of social change in the hands of Wall Street front groups like 350, Avaaz, Ceres and Purpose. The solution to looting of state treasuries by financial institutions, according to social capitalists featured on TRNN, is to create non-profit co-ops that are dependent on philanthropy. TRNN strategy is limited by dependency on capitalism, which funds them as gatekeepers. They offer liberals a place for venting rage, then point them toward false solutions, promoted by other capitalist-dependent liberals. TRNN has never exposed the brainwashing of liberal capitalism, because they are part of it. Ironically, the only funding for research on violent white supremacy in the US has come from MacArthur and Ford. All my liberal colleagues take Ford or MacArthur money, and consequently have kept silent about Ford’s role in global privatization, as well as continental ethnic cleansing of indigenous peoples. Their research is valuable, but they are reluctant to acknowledge the significant contribution Public Good Project has made to their work, because we also expose Ford Foundation fraud. Until they and TRNN divorce themselves from this dependency, their message will continue distorting reality by omission.